Katonah Yoga founder Nevine Michaan has developed a new planner to help you with mapping your intentions and desires to find your inner joy. Ever wonder where yoga teachers take class? Chances are they’ve explored Katonah Yoga. Nevine Michaan is the founder and creator of Katonah Yoga, a practical approach that entwines the body, the breath, and the imagination. Nevine’s new planner can help you begin mapping time and space for joy in your life. Click here for more details. Want to try Katonah Yoga? Catch a Katonah Yoga class at Wanderlust Stratton this summer! For more information, click here. As we begin this new year, we ask ourselves: where am I going? How do I get there? When do I begin? The ringing in of a New Year is a bell that wakes us to an understanding that the present is the only moment that’s explicit. The past and the future are implicit, unseen, and totally predicated on how we direct ourselves now. This moment of waking up allows you to step back, be reflective, and thoughtfully plan your way forward. What I teach my students is that the destination is always joy. And because joy is inherent when you show up at the right place at the right time, most of the techniques I’ve developed and shared are about mediating the moment, and understanding how to organize and orient oneself in time and space. One practical example I like to give people is making a date with a friend. If you say, “let’s meet at the museum” the questions become: Where’s the museum? And at what time? If you miss one of those things—you go to the wrong museum, or you get there two hours late—not only is your friend going to be annoyed, but you’re going to be bitter that you couldn’t keep your commitment. But, if you show up where you agreed to be, when you agreed to be there, you will have the joy of seeing your friend and keeping your commitment. During asana practice, one of the things I ask students is: Where are you going? It’s a reminder to remember that your goal is to move towards a vision that brings you joy. When you do find joy, you’re able to reflect in gratitude that you followed through and it got you there. This grateful reflection represents the direct line between where you’re going and what you see out the rear-view mirror. Because your memories are always a reflection of where you’re going in this very moment. To substantiate and articulate these concepts, I’ve designed maps that explore the mind, the body, and the breath of the individual; they also explore the personal mediation of time and space and the great nature. This map divides the body into 9 rooms. Each room of the house is unique with a different character, view, and function. In its wholeness, it is an integrated, living organism that is greater than the sum of its parts. These maps act as both meditation manual and geographical charts of the body, to allow those who use them to see the landscape and mediate the known and unknown. 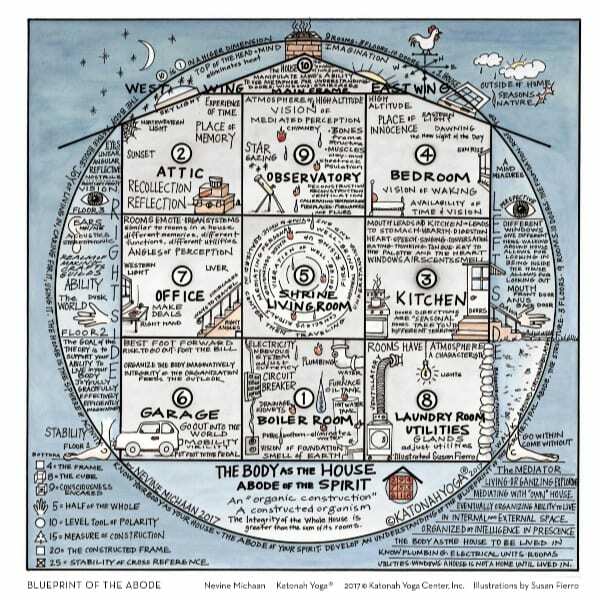 They explore the big picture, one’s wholeness and details, and territory for exploration with the breath and mind.All of these maps are designed on a 3×3 space grid, establishing space that’s oriented on a compass rose. Ultimately, they’re used to understand where you are, how to find your way, and to give you a process for moving through time and space to arrive at goals and destinations. 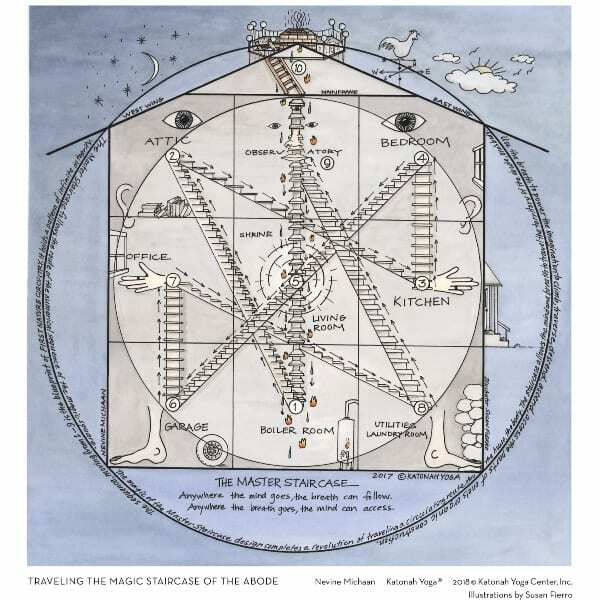 This map informs a dynamic meditation where the breath is used to travel through time and space, allowing the imagination to visit different rooms in oneself. I chose a planner to house these maps because the format is immediate, interactive, and reflective. Calendars not only codify time through the year, the month, and the week, they articulate the lunar phases, annual full moon cycle, and shifting hours of daylight. The intention is for them to serve as a practical as well as mystical template for personal time management and contemplation. After a year of working with a calendar, you have a composition of your actions and reflections in time. This well-worn calendar becomes an intimate revelation on how you use time—the moment, the day, the seasons. And time is imminently fair. While all of us are born in different places, with different families, rights, and privileges, everyone gets 24 hours in a day. Using that time to potentiate your vision of joy is something that is not only practical but extremely powerful. Make it a point to spend time looking over your calendar. Organize your day, your thoughts, your plans. Reference your goals regularly and reflect on your experiences. Understanding where you are in space allows you to mediate where you position yourself, and helps you define and refine how you can arrive at your destination on time. In this way, every year becomes an opportunity to move towards your vision. Knowing that directing yourself towards joy is an opportunity to experience gratitude for the daily, weekly, monthly efforts that have brought you here. Nevine Michaan is the founder and creator of Katonah Yoga, a syncretic Hatha yoga practice developed over 40 years. She and her teachers incorporate classical Hatha yoga with Taoist theory, geometry, magic, mythology, metaphor, and imagination—in a practical framework designed to potentiate personal and communal well-being. Many consider her a philosopher, a poet, a seer. Her practical approach entwines the body, the breath and the imagination. To find out more about the material featured here, visit KatonahYoga.com.